I have just returned from a quick trip to Georgia. That’s Georgia the former communist state that loosened its leash from Russia only 22 years ago, rather than the southern American state that counts the shark’s tooth as its state fossil and the green tree frog as its representative amphibian. I endured one day trudging through the capital Tbilisi, staring at old and new churches, mosques and synagogues; and thoroughly enjoyed six days in the high and empty hills to the north of country. I was leading a group on a trek through the Khevsureti range, part of the Caucasus chain that crumples up against the small republics of Chechnya and Dagestan. Aside from numerous river crossings, two memorable (but connected) aspects of the trip stood out for me. Firstly, the abundance of wildflowers that carpeted the hills. Every day I brushed through a sea of green splashed copiously with all the colours of the rainbow. Geraniums, lilies, orchids, daisies, thyme, vetches, clover, cornflowers, scabious and hawkweed are just some of the blooms I recognized, many more I couldn’t put a name to. Glimpsed from a distance the slopes resembled an abstract painting by Jackson Pollock - one of his brighter offerings. Secondly was the gentle but insistent hum that filled the air - a low drone of countless insects going about the no-nonsense, urgent business of gathering nectar. Prime amongst these winged collectors were the bees. Every flower head seemed to hold a furred yellow and black brooch-like worker. Coincidentally, I had just finished reading the excellent Tony Juniper book What Has Nature Ever Done For Us? In it he argues that the vast array of services that nature provides for free can be measured in simple economic terms. In other words, for those people who cannot realise the intrinsic value of the natural world for its own sake, he sums up the economic worth of keeping the planet in balance. Put another way, if we continue meddling with that crucial balance and it’s going to start costing us, humans, Big Time. One particular chapter struck a chord with me, The Pollinators, and heightened my interest in the bees I encountered in Georgia. Tony Juniper suggests that two thirds of our major crop plants rely on animal pollinators and calculates the annual value of the service provided by the pollinators to be 190 billion US dollars. King of the pollinators are the bees, but these busy little critters are relentlessly coming under fire from a lot of different angles; pesticides, parasites, climate change, habitat decimation and genetic modification to suit our own needs. 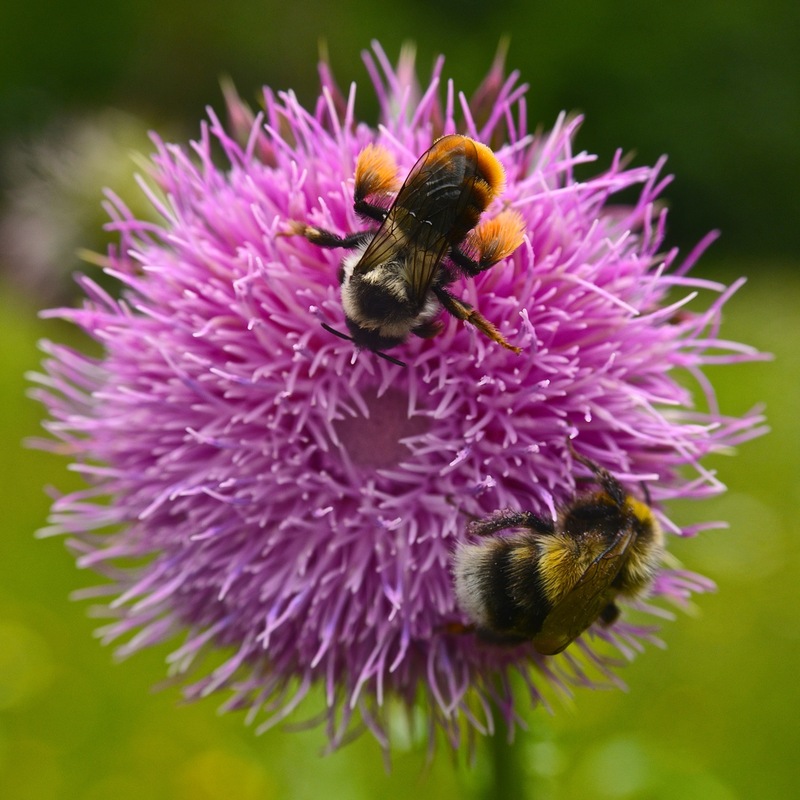 The operations director of the International Bee Research Association, Julian Rees, believes that 97-98% of plants that bees can feed on have been lost in the past 50 years. Put bluntly, bees are in a lot of trouble. ‘Across the world,’ writes Tony Juniper, ‘there are farming communities who are aware of the practical value of pollinators - because of their absence’. He cites the agricultural belt in California where each spring a million hives are carted in from all over the country so that bees can pollinate the almond trees. Eac h hive costs $200. That amounts to a lot of money to assist in the growth of some nuts. 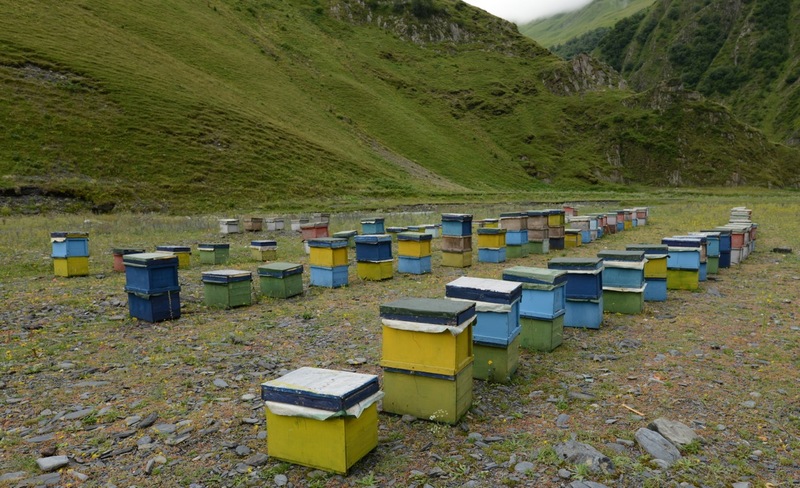 In the not-too-distant past local bees and other pollinating animals would have provided the service freely, but these have virtually been wiped out by the intensive farming practices that now dominate. In China the response to the loss of pollinators is somewhat more draconian: people climb ladders and brush the flowers of each and every tree by hand, taking over the job that bees and other buzzers have done for millennia. If that doesn't make you pause for thought, then what will? While travelling across Georgia I was struck by the number of hives dotted across the landscape. Every small village had several collections of bright wooden boxes, and numerous sites by the road held regimented rows of them. 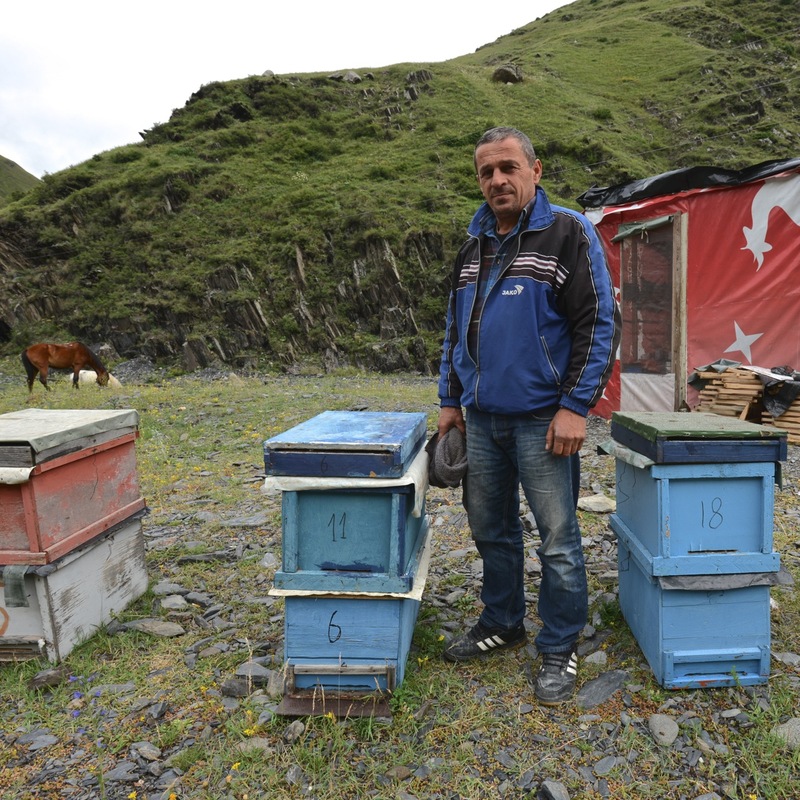 But rather than placing hives there as a necessary tool to pollination, the beekeepers were using the little collectors to harvest the nectar and create the sweet by-product, the honey. 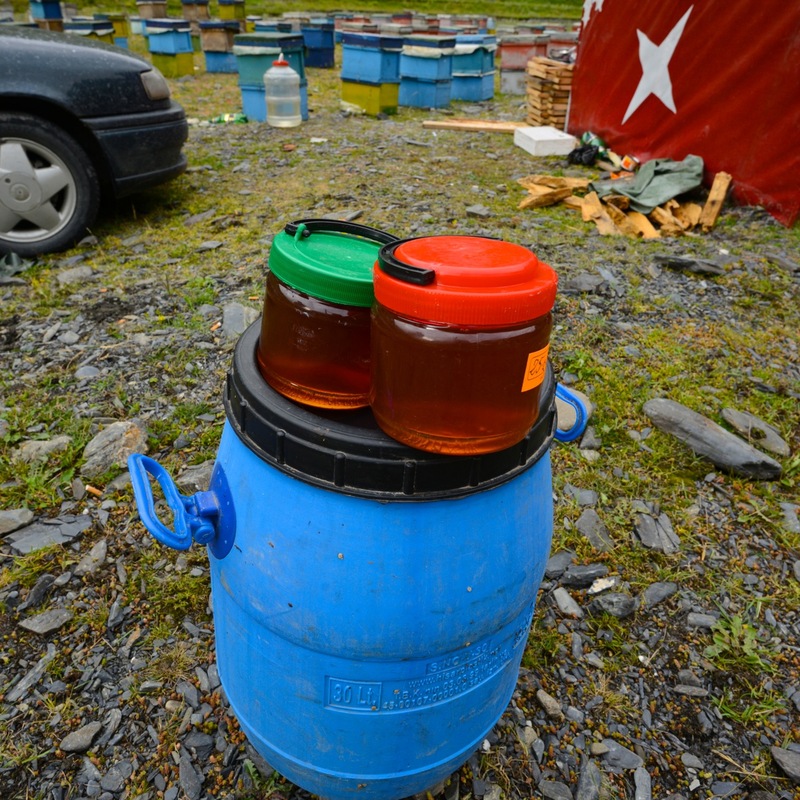 It would appear that Georgians love their honey. Near the village of Juta, at the start of our trek, there was a rusted blue car parked beside a star-patterned hut. This was the temporary home of a track-suited, forty-something guy. And around it were spread at least 200 hives, each containing thirty to forty thousand bees. From dawn til dusk the worker bees would cover many miles in the surrounding hills, bringing back the nectar, and heavily dusted in pollen. The grizzled guy was happy for me to snap away at him and his hives – happy, but puzzled as to why I would want to take pictures of something that seemed so commonplace to him. The question that constantly nagged at me was: Are the bees there because of the profuse diversity of flowers, or are the flowers prolific thanks to the bees? But maybe it doesn’t matter: it’s great to have a healthy amount of both. Incidentally, the ‘state insect’ of Georgia in the US is the honeybee. Is its fate to buzz merrily among flowers and trees as it wishes, or to battle against defiant odds, and maybe be lucky enough to become part of a travelling hive trail? The statement from Julian Rees at the International Bee Research comes from an article by Nigel Richardson in the Telegraph.